Middles can be like a big slump – the middle of the work day, the middle seat in the back of a car or the middle of a novel. I am at the midpoint of my novel about a 35-year-old artist named Kate who loses everything in an apartment fire and tries to replace her belongings, only to damage herself in the process. My writer friend gave me a beat sheet that outlines 15 beats of a novel from the opening image to the final image. A novel’s arc consists of three large beats, those of the rising action, climax, and falling action and resolution. This description does not identify the middle, because the arc is shaped to rise along one long line and drop down in a slightly curved shorter line. According to the beat sheet, the middle is the point where the main character reaches “a false peak or false collapse” (see “Blake Snyder Beat Sheet”). The stakes are raised for this character, who already is reeling from what appears to be bad news from earlier in the story. The bad news, such as Kate losing her home, sets her on the path toward the change she needs. Fun and games follows, which for Kate is hanging out with her friends, though she continually thinks of the things she’s lost, such as her paintings, the ceramic kittens from her Nana and her teddy bear from her childhood. But at the midpoint, this fun is over. The next quarter of the story unfolds as “the bad guys (things) close in,” which, for Kate, are her friends who give her a hard time for being “so sentimental,” along with a few other losses that I haven’t fully worked out. At the moment of “All Is Lost,” the main character has to give up her old ways, clearing the way for her to change. In the rest of the story, she applies the lessons she’s learned and her old world ends to make way for her new world. I haven’t quite figured out those lessons for Kate, though they will have to do with the realization that stuff just doesn’t matter, including those friends that burn without sparking your fire. In cases where the middle is sagging, I like to evaluate the individual scenes and chapters to see if they are needed and fit into the arc. Do they propel the story forward? Or do they seem like extras, a tangent that takes the reader in an odd direction without being tied to the story? Scenes and passages that cannot be cut will not require too much additional work to modify the story. For example, I wondered if I needed Kate’s puppy, Flame, who appeared without my conscious planning. After thinking about my story, I realized that if I cut Flame, I would end up removing part of what is necessary to teach Kate what she needs to learn – that there is love in Flame, or love that comes out of a fire. For the reader, this concept is essential, or the story or novel will fall apart at the end. It is the resolution of the storyline. A story’s resolution can be open-ended or conclude all that has happened before, drawing together the symbols, images, characters and separate plotlines into a perfect last sentence. Stories are structured to follow an arc – consisting of the rising action, the climax, and the falling action and resolution, or the beginning, middle and end. A conflict is introduced that in the middle is complicated only to be resolved later on. At the midpoint, the stakes are raised for the main character. And at the point of the resolution, the plot complications are unraveled, while any loose ends are explained. In more detail, the rising action begins with the presentation of essential information through character development, narration and dialogue. The story’s action rises through a complication, where the point-of-view character encounters conflict that can be internal, external or both. The climax is the story’s turning point. It is the peak, or most intense part, of the telling and the result of all the events preceding it. At this point, the character has to make a decision, resolve a problem or face a new challenge in order to end her conflict. If she decides to remain with the status quo, she will suffer the consequences. The falling action is what results from the climax and occurs near the story’s end. The resolution, also called a reversal or denouement, is where the problem of the story is resolved or worked out. A reversal comes into play when there is a change in the character’s situation, while the denouement gives relief to the readers that all will work out in the telling of the story. In my latest novel, “One April Day,” the resolution is the point at which the main character, Maggie Cooper, realizes she does not need to listen to what other people tell her to do to figure out what is best for her life. She doesn’t need to follow what turned out to be a false prophecy to get what she wants – to write novels instead of working in journalism. The resolution in my story or any other story is the point at which the plot no longer needs to move forward. The ending resolves the conflict and situation both for the main character and the plotline. If books were just about the climax of the story, they would be less than a page. Or if they included the mini-climaxes up to the big one, the telling could be stretched to a few pages. A story is told to build toward that climax, or the peak or most intense part of the telling. The climax is the result of all the events preceding it. The pace of the telling needs to steadily increase toward the climax. In my novel “Dropping Colors,” my protagonist Kate Letts, a 35-year-old oil painter working in retail, loses everything she owns in an apartment fire. To try to replace her lost things, she ensues in a search of thrift shops, flea markets and the like. Her search is self-destructive and just when she thinks she’s lost more than physical things, such as her inspiration to do her art, she finds the skeleton key (something she is not supposed to have but that has intense meaning for her). Since I’m halfway through the telling and very brief in my outlines, I have yet to find this compelling moment in my story. But for my reader, it will be the peak of emotional response, as well as the turning point in the story’s action that always follows some crisis. Stories follow a classic formula that includes the rising action, the climax and the falling action, or the beginning, middle and end. At the climax, the main character will make a discovery that changes her life. She encounters the largest obstacle, and how she responds determines whether she will win or lose. If she loses, it’s at the ending where she will figure out how to turn things around. If she wins, she still will affect the outcome of the story. The climax is when the character is transformed. It’s her moment of truth. And it is her new normal. I don’t yet know exactly what Kate will discover, but it will be along the lines of understanding that the things we accrue through the process of living do not mean much when compared with something more important (which also will be my theme). As a yet-to-be published novelist, tension seems to be the banal of my existence. I understand what the concept means when I think of a taut rubber band, compared with that element of writing that keeps readers turning the pages. But when it comes to applying the concept to writing, I struggle with the required maintenance. Though I already addressed tension last month in my blog challenge to write about 52 writing topics in 52 weeks, “52: A Year of Writing Basics, Beliefs and Beauty,” I now realize that I have to tweak my understanding. Kate Letts is my protagonist, or point-of-view character, who loses everything she owns in an apartment fire and tries to replace her lost things only to find something better. My writer friend loaned me her copy of “The Fire in Fiction: passion, purpose and techniques to make your novel great,” by Donald Maass, published in 2009. In chapter 8, “Tension All the Time,” Maass states that conflict is story, but that one large, overriding conflict is not all that drives the story. Conflict also needs to be present in smaller ways through micro-tension, or the tension within each moment of the story’s unfolding that keeps readers curious about what happens next. Tension is not a function of plot, Maass said. In dialogue, it comes through the emotional friction between the characters speaking; in action, from inside the point-of-view character experiencing it; and in exposition, that character’s conflicting emotions. As I understand what Maass is saying, tension boils down to feelings and emotions in each moment of the story. And as stated in my earlier blog on the same subject, tension is the result of character conflict: internal conflicts are about characters, while external conflicts are about plot. Tension is what turns cardboard or cliché characters into sentient beings that experience the world through the filter of their own emotions, experiences and worldviews. As soon as you put the point-of-view characters in a setting, what makes the environment become real? It’s not just the details, but how the character experiences them. This character feels his or her world, just as we all do. 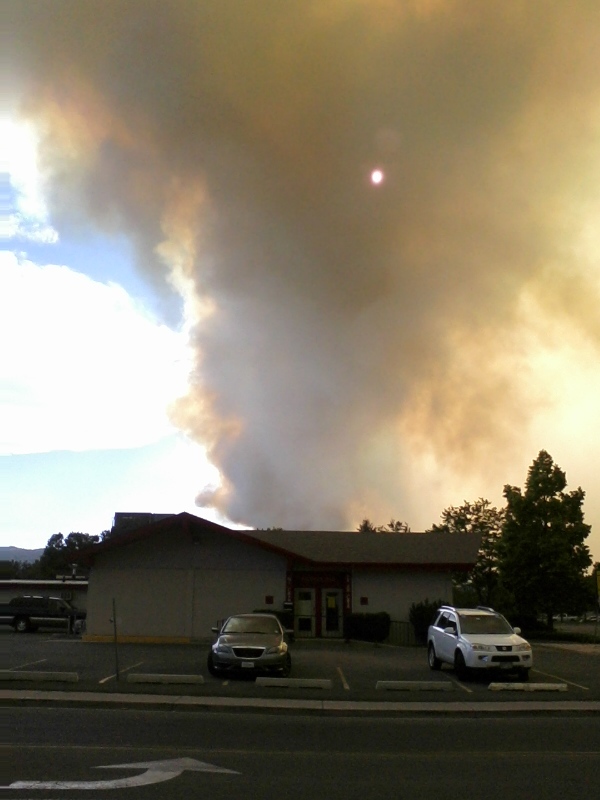 The High Park fire as viewed from Fort Collins, Colorado. When the wind rode my laptop screen as if it were a sail, pushing my years of work across the table and onto the cement ground, I panicked. Had I saved my latest work on my flashdrive? What if I lost a few pages, a few poems or a short story? This was before theHighPark fire struck northernLarimerCounty, smothering the air in my hometown with the smells of a campfire gone wrong. From a lightning strike, thousands of burning acres. Evacuees. Lost homes. Harmed wildlife. A story that is becoming too large to imagine, at least from the outside. I am writing about fire, a project I started in January nearly six months before my environment became engulfed in the smell, the texture (ashes drop like gray snowflakes), the sight (the smoke rises off the mountain as if from a chimney) and the taste and sound of burning . My character in “Dropping Colors,” has lost her home in an apartment fire and is on the quest to find her lost things. A few of theHighParkevacuees had the chance to grab their essentials and most important personal things. Kate Letts, my character, does not get that chance and becomes reflective about the meaning of stuff. Writing is about stuff, about loss and gain and about fire and the flame that lets the words burn. That burn will be revealed in my six-month review of blogging about 52: A Year of Writing Basics, Beliefs and Beauty. Here’s the stuff, or what is essential to writing: Plot, Setting, Character, Dialogue, Voice, Pacing, Flashbacks, Scenes, Arc, Storytelling. The elements of fiction that are the pieces of wood in a fire. The match is that initial idea for a character identity, an outline for a story or a snippet of something seen or overheard with the unanswered What If? Strike the match to that pile of wood symbolizing the writer’s blank page. The spark is the inspiration, motivation, creativity and imagination that ignite the initial idea into flow. Flow is the opposite of writer’s block, which is the state of mind when words refuse to come. Flow is losing track of time, place and whatever evokes the senses and getting lost in the telling of the story. For me, it’s almost like reading, because I am not in complete control, though I am conscious, at least somewhat, that I am writing. To stoke the fire to last until the next writing session, find a good stopping point in the middle of a scene or a chapter or an idea. That way the flame can be picked up to continue the writing burn. Stoking the fire is keeping to a writing schedule. It is discipline. It is putting time into the craft and art of storytelling. To keep on writing, there needs to be goals, a belief in the self and the knowledge that this is a rough draft. Just as the main character has to face her flaws, fears and limitations and overcome them to get what she wants, the writer has to work through the same things. That’s what passion is, doing this thing you love without ever giving up. Despite heartbreak. Despite being told your work is ashes. Despite not having a home for your words. Writing is Catching Fire, Running with the Wind and Being Wild with all the elements of fiction, so that what results is a thing of beauty. From fire comes a myriad of colors that cannot be washed away. It becomes part of the text, so that the readers lose track of their own settings, identities and stories of their lives.